FORT BRAGG, N.C. (USASOC News Service)—An Army Ranger assigned to 2nd Battalion, 75th Ranger Regiment, Fort Lewis, Wash., died as a result of gunshot wounds received during combat operations June 9, 2008. Spc. Thomas F. Duncan III, 21, of Rowlett, Texas died in Iraq. In accordance with Army regulations, the events surrounding his death are currently under investigation. However, initial indications are that Duncan’s wounds may have resulted from friendly fire. Duncan volunteered for military service and entered the Army in February 2006. After completing One Station Unit Training, Basic Airborne Course and the 75th Ranger Regiment’s Ranger Indoctrination Program training at Fort Benning, Ga., he was assigned to 2nd Bn., in September 2006. He served as an assistant machine gunner, M240B machine gunner and as a grenadier. AP reports that Spc. Christopher Gathercole, of Santa Rosa, Calif., was hit by small arms fire and died Monday near Ghazni, Afghanistan. He was assigned to Fort Lewis's 2-75th Ranger Regiment. Tillman in Hall of Fame? Pat Tillman, a former Arizona State linebacker who gave up a professional football career to join the Ranger Battalion at Fort Lewis, is among 19 players up for election to the College Football Hall of Fame. Click here for AP's story. When Henry “Zeke” Zyrkowski joined the 2nd Rangers in France 63 years ago, it had been five days since they had completed arguably one of the greatest and most daring assaults in the history of warfare at Pointe du Hoc. The unit that then-Pfc. Zyrkowski joined was Company D, or Dog Company, and it later would go on to further distinguish itself in Huertgen Forest and the Battle of the Bulge. Shortly after the conclusion of World War II, Dog Company was inactivated and its history lived on only through the veterans that served in its ranks. Zrykowski, a former mortar man, was on hand to uncase the unit’s guidon with Lt. Col. Michael E. Kurilla, the 2nd Ranger Battalion commander. Kurilla said he was honored to have Zyrkowski participate in the ceremony. Major Jonathan M. Chung, the new commander of Company D, said he looks forward to adding to the lineage of the Rangers and his new unit. The addition of this company to the Ranger ranks “increases the flexibility on today’s battlefield,” Company D’s 1st Sgt. Reese Teakell said. 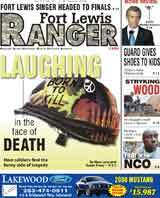 The Seattle Weekly has a story out today discussing friendly fires and accidents...mainly how they pertain to the 2-75th Rangers at Fort Lewis. Click here. (DoD News Release) – The Department of Defense announced today the death of a soldier who was supporting Operation Enduring Freedom. Spc. George V. Libby, 23, of Aberdeen, N.C., died Aug. 20 near Khowst, Afghanistan, of injuries suffered from a non-combat related incident. He was assigned to the 2nd Battalion, 75th Ranger Regiment, Fort Lewis, Wash. The Department of Defense announced Thursday the death of a soldier who was supporting Operation Iraqi Freedom. Cpl. Jason M. Kessler, 29, of Mount Vernon, Wash., died July 30 in northern Iraq of wounds suffered from a rocket-propelled grenade. He was assigned to C Company, 2nd Battalion, 75th Ranger Regiment, Fort Lewis, Wash. In another twist to the bank robbery last year in Tacoma, Luke Sommer, the former Army Ranger from Fort Lewis who masterminded the heist has fled house arrest in Canada. The Seattle Times reports. Amy Packard, the mother of First Lt. Kyle Packard, a Ranger with the 2-75th Ranger Battalion at Fort Lewis discusses how hard it is to wait while her son serves in Iraq. Click here for KCCI's report from Des Moines. The death of Fort Lewis Ranger and NFL star Pat Tillman is back in the news as a former Fort Lewis Ranger says he was told to conceal the truth. Click here for the story from CBS.